Here we have a seed tray of Corn, Spinach, Snow peas and Marigolds We got our seeds germinated with our little hothouse. We put rows of seeds in this seed raising tray and sit it on the top, hottest shelf till they get started. 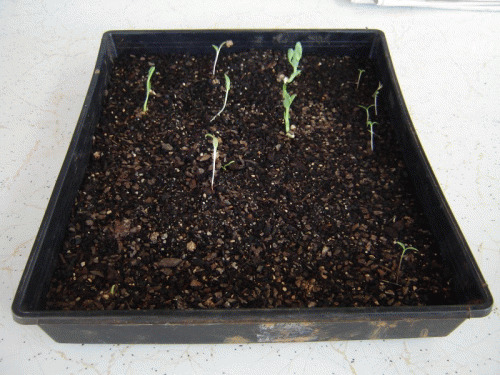 This tray has had some seedlings removed, while others continue to come along. 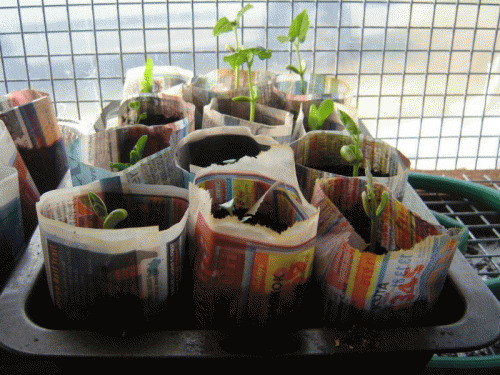 Next stage is into the newspaper seedling cups, pictured above. This is just old newspaper rolled around an aluminum tin. Take if off the tin and fill with seed raising mix. Here we have Beans, snowpeas, tomatoes and corn. This tray now sits on the second shelf of the seed germinator. Not quite as warm as the top shelf but still protected. Once these seedlings are established and the weather outside is good we plant the whole newspaper pot in the vege garden. This process will continue all year. 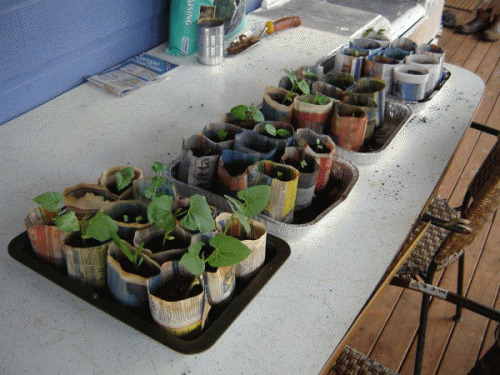 Seeds germinate, get moved to paper pots, grow and harden up, get moved to garden. When a seed tray is empty I will fill it again. These are our seeds about three weeks from the start. The first tray is the tray in the photo above. The rest I have been gradually moving from the seed trays to these paper pots. Nearly time to put them out in the vege patch.